Dempsey and Makepeace is a British crime drama focusing on the relationship between American Lt. James Dempsey (Michael Brandon) and British Detective Sgt. Harriet Makepeace (Glynis Barber). Dempsey was sent to England after his career ran into trouble in New York, and has been partnered up with Makepeace, under the watchful eye of Chief Superintendent Spikings (Ray Smith). In episode 9 of Series 1, Makepeace receives the news that her father’s house has been burgled. By Royal Intervention, the detective duo is ordered to investigate and restore the missing collection of priceless Jade artefacts. The episode stars franchise regulars Michael Brandon (Captain America: The First Avenger) Glynis Barber (Hammer of the Gods) and Ray Smith (Struggle, We’ll Meet Again). Guest stars include Ralph Michael (The Quest, Kessler), Keith Bonnard (Noble House, Shanghai Surprise), Ralph Arliss (Grange Hill, Retrace), Seretta Wilson (The Da Vinci Code, London Bridge), and John Terry (Brothers and Sisters, Lost). Chilham Castle becomes Winfield Hall, the grand English estate of Lord Winfield (Ralph Michael) in this episode. The Jacobean mansion was built in 1616 on the site of an ancient castle, and is now the private home of the Wheeler family. The castle has previously hosted productions such as Hercule Poirot’s Christmas (1995) and Miss Marple – The Moving Finger (2006). Chilham Square, which is considered to be one of the most perfectly preserved medieval settings in the South East of England, makes a brief appearance in this episode. 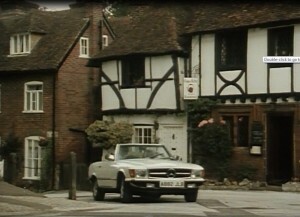 Dempsey and Makepeace drive through the square as they approach the grand gates to Winfield Hall. Chilham has previously featured in Chickens (2011), Emma (2009), and The Amorous Adventures of Moll Flanders (1965). The episode first aired in 1985 on ITV and is now available to buy on DVD. This entry was posted in Filmed in Kent and tagged Chilham Castle, Chilham Square, Dempsey and Makepeace ‘Cry God for Harry’ film locations, TV Drama. Bookmark the permalink.